My daughter has soooo eagerly anticipated the start of Year 7 and her secondary school career. Weeks of organising books, writing utensils, school bags -- and modelling all her school uniform items. After years of watching high school hijinks on American shows like Lizzy Maquire, That's So Raven and Hanna Montana, it's now her turn to experience the real thing in Oz. 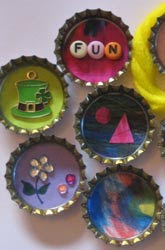 Given the school locker seems to symbolise this crucial period of a teen's life, she has cleverly crafted magnets out of bottle caps to decorate her first locker. How lucky that her locker is right beside her new friend who lives three doors away from our home.